What is Kyphosis and Scoliosis? Home / NEWS / What is Kyphosis and Scoliosis? This can be caused either by hereditary or developmental factors (metabolic, habitual postures, lack of exercise etc). There are over 80 types of scoliosis and some causes are unknown (ideopathic). Curvatures up to 40 degrees can be treated non-surgically but the condition should be arrested as soon as possible by non-surgical treatment. It can be treated through spinal mobilisation, making the condition symptomless through a specific set of spinal exercises which will strengthen the underdeveloped group of muscles. Specific exercises (all of which are carried out while lying down) will cause further growth in the musculo skeletal system that will balance the scoliosis. The main purpose of mobilisation is to re-align the spinal column joints as much as possible and to decompress the nerve roots and soft tissues. Scoliosis becomes worse when changing position, as stresses and strains are altered, so the tendency for the patient is to lie down for relief (body pressure on the spine is 25% of the weight when lying down on the back with knees bent). The body pressure increases depending on the posture: sitting can produce an average pressure of 80/100 kg on the lumbar spine; standing 100-120kg; while sitting and bending forward for writing can produce 140kg. 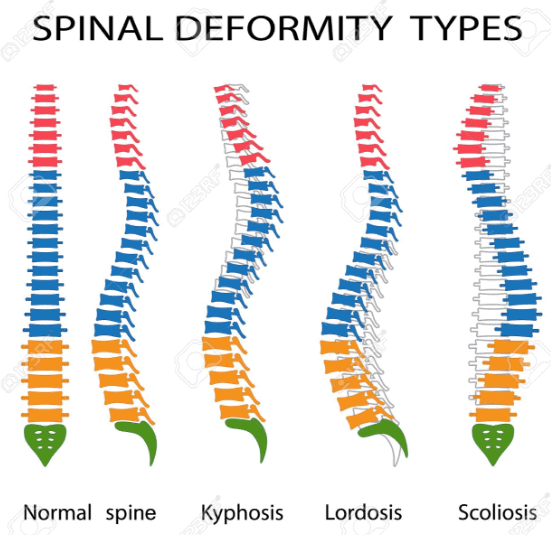 The spine is obviously weaker with scoliosis, and the balance of spinal fluids can change considerably (causing homeostatic osmosis in the cerebrospinal fluid). This results in general fatigue, depression, exhaustion, stress, headaches, irritability and organ dysfunctions. Most cases of adult scoliosis are idiopathic, which means we do not know their cause. … Idiopathic Curve – This is the most common type. Usually there is no clear-cut reason why the spine is curved. Congenital Curve – The term “congenital” means that you were born with the problem. The symptoms that come with scoliosis (general fatigue, depression, exhaustion, stress, headaches, irritability and organ dysfunctions) can be helped with the use of the Backrack System and carrying out the instructed exercises to maintain the situation from getting any worse. Backrack needs to be part of a healthy lifestyle in order to treat symptoms. It cannot fix a curvature as this is a bone deformity, however it can stop things getting worse as a preventative method and will not make anything worse.